While I am proud of my adopted state, New Jersey, and I feel that we have many things to offer to those seeking culinary enlightenment and can hold our own in many ways in terms of dining and food options relative to options in Manhattan, there are certain things we just don’t do nearly as well. One of those things is Bagels. Having grown up on the Nassau/Queens border, I know what a good bagel should look and taste like. Firstly, they should be boiled, not steamed, and they should have a nice crust. The inside should be chewy, but not doughy, and it should be fully cooked. And preferably, you should buy them baked fresh and they should still be warm from the oven, because the bagel place should have high turnover. New Yorkers, particularly New York Jews, frequently argue over who has the best bagels in the city. Heated fights have been known to break out, and it sometimes can become a battle between East Siders and West Siders, not unlike the age old ideological disputes between the Litvaks and the Galitzainers. Personally, I like to get my New York bagels from any good established bagel shop. While I used to get my bagels from H&H, with their factory store conveniently located right off the West Side Highway (the natural route I take back home from destinations in Manhattan) I think that Ess-A-Bagel is my new favorite. Why? Well for starters, their bagels are only 75 cents apeice, whereas the H&H ones are now going for over a dollar, and I think thats highway robbery. Also, H&H is pretty much a straightforward bagel bakery, whereas Ess-A-Bagel is a true Appetizing store, in every sense of the word. 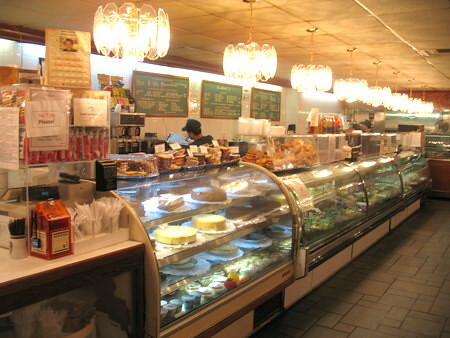 They got every kind of salad and cream cheese you could possibly want, and the atmosphere is classic. The Ess-A-Bagel store on 3rd avenue. The original store on 1st was opened in 1976. 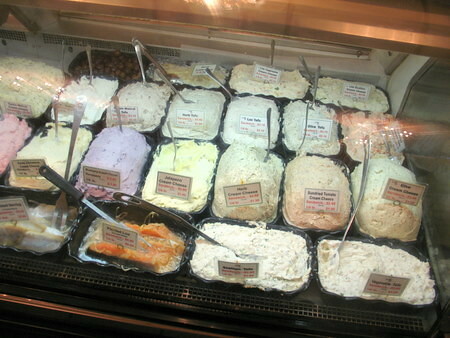 Talk about a cream cheese spread! New York bagels, the real mccoy. I’m particularly fond of the dark pumpernickel bagels here, which come in either raisin-free (my preference) or with. These were still nice and warm when I picked them up, and created the most indredible smell inside my car on the way back. This entry was posted on Friday, February 23rd, 2007 at 5:25 pm and is filed under Food, General, Links, New York City. You can follow any responses to this entry through the RSS 2.0 feed. You can leave a response, or trackback from your own site. I lived a mere 3 blocks away from the Ess-a-Bagel on First Avenue for more than 8 years. 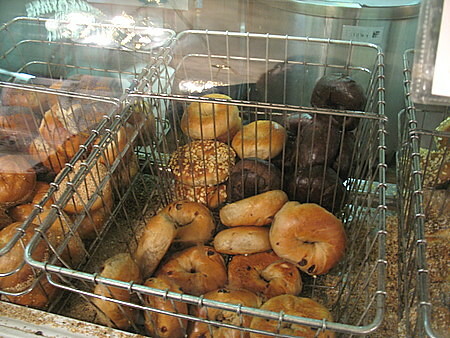 This place truly is the real mccoy, with the smell of freshly baked bagels 24/7 and a great appetizing selection. Even the plain bagels are full of flavor, altho’ my fave is the everything bagel. It’s the one thing I really miss about living in that ‘hood — stopping by early Sunday AM for a bagel with a schmear. I too grew up in NY, and consider myself a bagel maven. But the best? I’m putting my money on Sam’s in Wayne NJ! Yup, NJ. Damn you Jason, I’m craving a good chewy NY bagel now. The only ones I’m familar with are from Florida though. Even though I was born in NY, I dont remember what a real NY bagel tastes like. Unfortunately, I only get fresh bagels when I’m back in Florida, I have to do with toasted ones the rest of the year because I refuse to eat what they call bagels in Ontario. 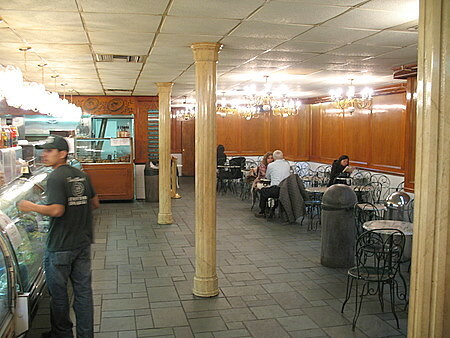 The bagels at Murray’s Bagels, Sixth Avenue, between 12th and 13th Street,are better. Daniel I haven’t been to Sam’s, but some time I’ll check it out. I had been to Sonny Amster’s bakery, which had the special Watson bagels, but alas, the place is now closed. Sandy I haven’t been to Murray’s, but I’ll check that out the next time I am in that area. I haven’t been to Tal bagels either. So many bagel places, so little time. A native New Yorker introduced me to Ess-a-Bagels on 1st in the early 90’s. I’ve never had a better bagel period. Hands down, the best bagels around. Think I’ll place an order now! Having made and baked bagels as a teenager(In NY) I can tell you that one of the most important things about making bagels is if they are hand rolled. The machine made ones heat up the dough too much (I think most places use machines today). I can’t disagee with you more about NJ bagels, I can think of two places in Clifton that natch up with anything in NYC. AS far as APPY goes Ronnies in Hillsdale does a good job, but expensive. I believe there are still one or two places in Clifton that still use Sonny Amster’s “Watson” bagel recipe. You may have even pointed out on eG which ones they were. Do you remember? You’re wrong about NJ bagels. Sonny’s in South Orange makes a fantastic old-school bagel, and Super Duper Bagels in Livingston is world-class. I actually prefer their bagels to H&H’s (my second-favorite). I believe Sonny’s was the original shop to use Sonny Amster’s formula. When I say Jersey I mean Northern NJ for the most part, not Livingson/Morristown/South Orange/Montclair. This may be a sin, but, does anyone have the secret recipe for any of the above mentioned heavenly sounding bread makers from god? I am a New Yorker stuck overseas in a place where bagels are rarely seen and resemble hard donuts rather than what we all know they should be. I know it’s supposed to be the water, but I’m willing to give it a try, just to get a hint of that flavor, texture, etc. …. Help. I’ve checked the web, so I’m just curious if anyone has some better advice. Thanks and my taste buds are jealous of all of you, NYC or NJ! Enjoy what you got!